What game projects are you working on? <font face="Arial, Verdana" size="2">I thought it would be a good/interesting idea to post a summary of what each of us are working on here (if you have decided not to take the secretive approach). I'll start off with what I am doing. Feel free to tell me what a bad idea it is :P</font><div><font face="Arial, Verdana" size="2"><br></font></div><div><font face="Arial, Verdana" size="2">So the game, yet to be named, I am working on, is a 2D Zombie survival game programmed in Unity + C#. I am trying to take a different approach from your average zombie shooter. I'm trying to make it more to the likes (though not exactly) of what I believe a zombie apocalypse will be like. No I do not believe the few survivors would run around with guns. Most of it will probably running away and hiding! I will have some weapons though, maybe even some sci-fi, but I'll probably tend to stay away from that.</font></div><div><font face="Arial, Verdana" size="2"><br></font></div><div><font face="Arial, Verdana" size="2">At the moments I have hordes and hordes (1000's ) of zombies on my map. The map is really nothing yet - just a big tarmac with an equally ugly warehouse building in the center. It also features some stupid survivor AI, just running around, etc. They tend to run away from zombies when chased, but gang up on zombies when they believe it is safe (which is wrong most of the time :P ). Working on making smarter AI at the moment.</font></div><div><font face="Arial, Verdana" size="2"><br></font></div><div><font face="Arial, Verdana" size="2">There are still some resolution issues which I want to work out before posting a version online (don't want to make you guys downloading ~30mb just to discover it doesn't run on your monitor size). Can't wait to do this so I can get some criticism and opinions from you guys.</font></div><div><font face="Arial, Verdana" size="2"><br></font></div><div><font face="Arial, Verdana" size="2">Now, what are you guys working on? Cool, both of these sound interesting! Your first game sounds particularly difficult to implement. You should keep as updated. It will be interesting to see where you go with this. Best of luck! \o/<br><br>what are others working on? When I'm not working with @aodendaal on Nameless Mech Game (I'm on 3D model/animation and terrain generator duty, with other responsibilities pending), I'm working on a Unity remake of the Gears of War JRPG I built for a Game.Dev comp two years back. 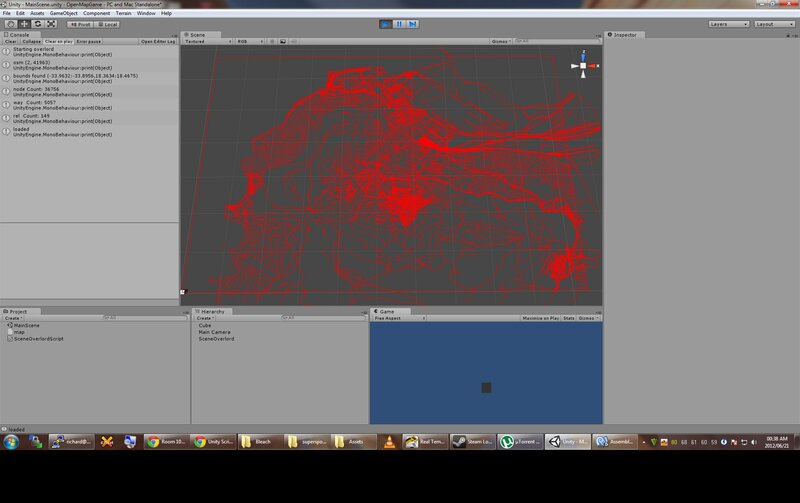 "I'm working on a Unity remake of the Gears of War JRPG I built for a Game.Dev comp two years back. Yes I am actually still busy with my tank game.... I am being pummeled at my day job but that should soon pass and then I hope to put in some good focused effort again :) In the meantime I'm trying to just build levels so that I can get ~20 finished for the game's campaign. Anyway, for my part, I handle animation, texturing, level design, environment art, sound and music. @DarkCarnivour handles the programming, character modelling, FX and art. I would like to try these games. I especially like medieval/dark ages type of games. Defs wana try this one out! I'm working on a game, officially named Fling Fu. It is a simple third person fighting game in which you fling your ninja-foot into some other ninja's face. Fun! ^ That game. So much win. @notsimon207 Was great to get a look at Fling Ninja last night :) I'll drop you a message with my email so I can get a test on device for you as discussed. * Content: So you have a great gameplay demo now, and you've made it clear you don't want to do levels that need to be progressed through, but you'd at least need some varied arenas to give your players some reason to keep playing. 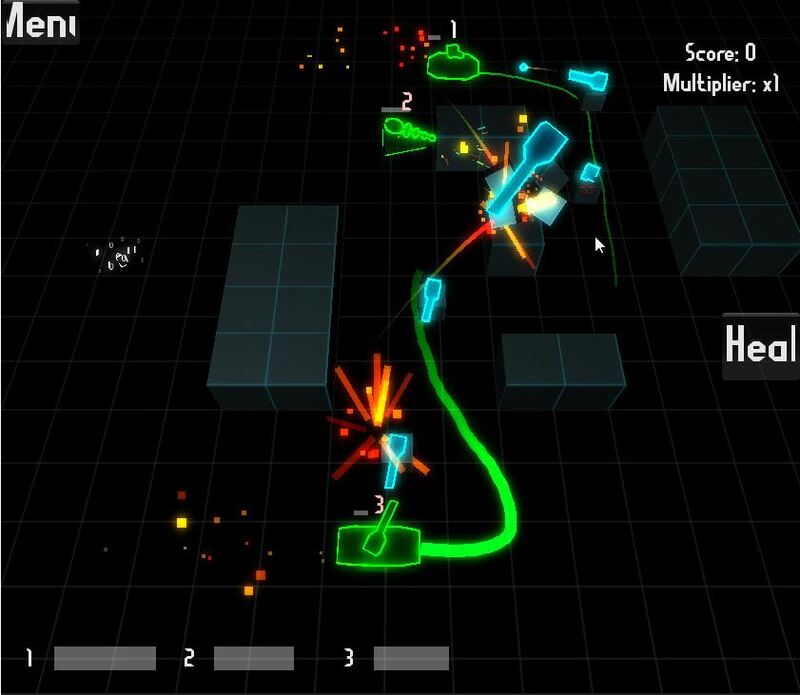 You did mention obstacles and traps, once those are in you're talking more of a real game. * Motivation/Progression: Again, as a gameplay demo it's fun, but other than killing all the enemies there's no real reason to play. So it's kill all the enemies, play once again maybe to kill all enemies, probably delete from device. So some kind of endless spawning of enemies perhaps? Starting with just a couple and ramping up to crazy. Maybe the enemies get bigger and tougher somehow? * Scoring: Builds on the motivation, score per hit perhaps? With higher score for certain hits? Perhaps this could be tied to the energy recharge, giving a bump in energy for high quality hits. How about a combo counter with energy recharge rewards based on chained hits? Ditto for varied hits. * Leaderboards: Once scoring is figured out, adding something like OpenFeint would be essential for devices. *Visual Juice (yay for talk reference :P): Simple blood particles or other effect on impact, swipe trails. As discussed your minimal monochrome look is AWESOME, so need to be careful to not detract from it, but splashes of colour from effects over the generally monochrome world and characters would stand out beautifully IMO. *Audio Juice: Was there audio? Need impact sounds at least and music. I know you said you'd rather be watching TV (seriously!?) but if you are one of the few people that actually have the luxury of spending a full 6-8 hours a day on this, you could probably get it launch ready in under two months. @notsimon207 I really want to see a video of that! @mattbenic That is sad, oh well I'm sure I can come up with something else. Thanks for the heads up. I am new to this web site and the game design community as a whole. I thought I would start posting here and let you all know what I am working on. I am currently in matric in Nelspruit and part of the IT project we can do whatever we want. I decided to try and design my own game engine as a learning experience and I am loving it! The one problem is it is in Delphi (I know, ancient language) but school only uses Delphi. The cool thing is I am using OpenGL so it should not be too difficult to translate it to another language like C++, if it turns out to be an alright game engine. Currently only have 2D texturing, working and state management, memory management and a few small things but hopefully it will turn out to be something good. That is my story. Looking forward to getting to know all of you, the game design community in South Africa. "The one problem is it is in Delphi"
"Hey, nothing wrong with using the tools you know, at least the first time around"
Wait, what!? Delphi certainly has generics and from what I've read of Delphi 7, records can have functions as well as constructors. It's pretty much a copy of Achtung (die kurwe!). It's a multiplayer only game (on one pc, different keys). It has LAN that doesn't work well and I never finished it. The reason I made it was because me and my friends used to play Achtung together, and here I just added some power-ups (which Actung didn't have back then. Keys: Spacebar to start the game (or new level, something like that). You can define keys for each player in-game. End key to escape. @aodendaal I believe Delphi 7 does not allow for constructors / methods in a record, but the later versions of Delphi have that feature, unless I am totally missing something! @Denzil Nice! I have never played Achtung before but this looks pretty awesome! :) Maybe one day when my project is complete I will show anyone who is interested. BTW everything everyone is working on sounds awesome! Working on "Doodle Space Defence" for android. It was majorly inspired by "Doodle Jumper". It's still in the very early stages of development. I've been dreaming of dungeons again... Sorry I can't help it. It's a +- 45MB zip and it will also get the Microsoft XNA framework during install. I created it with Microsoft XNA 4.0/C# in Feb/March 2012. The art assets and sounds are placeholders for now. 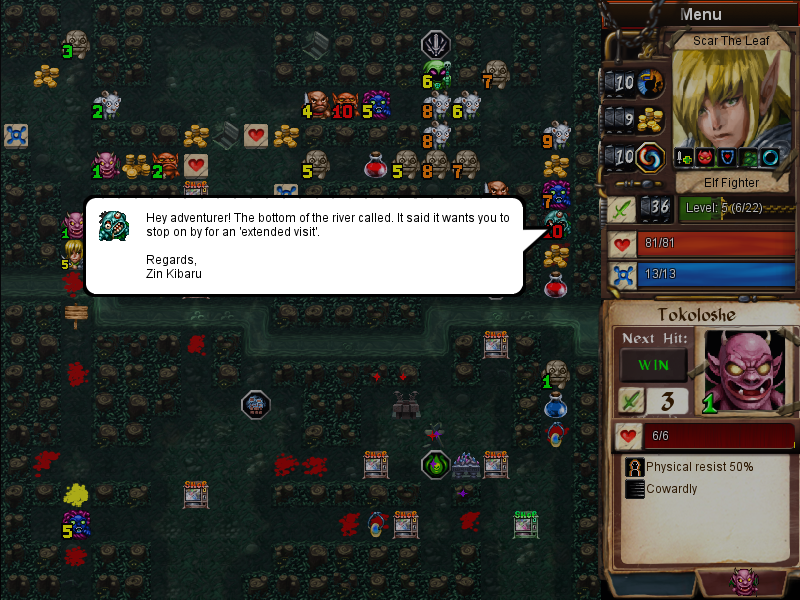 and how to get those baddies to attack me using an AI state machine was fun to explore. I am working on my own iOs side-scroller game at the moment. The main character "Lupe" will try and run away from the chasing Luchadores. As he runs he can grab various cacti from the landscape and hurl them back at the Luchadores, to try and disable them, and slow them down from catching him. There will be various different cacti with different powers for each level. Lupe will also be able to collect different powers such as “time warp” or “jetpack” etc. I still have to work out some of the gameplay dynamics, but allot of the artwork is already complete. I will eventually need a programmer to put this all together, so hoping to get some funding from Indiegogo.com, so that I can actually pay someone. But so far, no luck on that route! Hey, that's a brill idea. Ill try that. I don't think my pics uploaded? That looks really cool, have you thought about any methods for showing "progression" (apart from scrolling of course) such as changing time of day, increasing difficulty, more obstacles, etc? Also, have you decided what you want the programmer to use yet or not? (Im sure quite a few people would shy away from Objective-C for isntance, and the same would go for Unity or Game Maker) If you arent picky it may be easier to find someone to join up with you. I would offer to join up but I probably wont have time until later on in the year to dedicate to working speedily on any project. (All of my projects are crawling forward at a snails pace) If you dont mind the time I could always work slow, or barring that if you want to take a stab at it yourself there are more than enough people that could help out when you get stuck or have questions? @edg3, To answer your first question, ya, I have been playing around with some ideas for that. I am thinking of having a few different levels, that have different scenes. So that once you complete a level you go onto another area. Also time of day would change. And obstacles would be harder and more frequent, but that will all have to be worked out with the programmer, so we can see how it works. I am thinking most of it would be allot like "run like hell". I don't want to get too complicated tho. I am thinking about having different "luchadors" for each level. What I am struggling with now is how the controls will work, and how fast the Luchadors will catch up, and how "lupe" timing in throwing the cacti bombs will work. I can see it in my head, but that's were I need a programmer to work closely with. I could use the same guys I used with the "bush pilot" game. They recon they can do it for about $3600, or collaboration with percentage profit share. But they are in Italy, and I would prefer someone locally. I would like to get this first level working as a prototype, so I can get a feel for how it will work, and then iron out the gameplay. The other problem is payment. I was hoping to raise some funding, but I am useless at the marketing side (typical artist!). It's also possible I could go the collaboration route, and share profits, but that's not always easy for anyone here at the moment. I have been trying out "Spriter" for the sprite animations, and it looks awsum, especially if the programmer I work with can use the pluggins! As for doing the programming myself, no thank you. I am not that way inclined, although I was playing around with Gamesalad, pretty good program. I would rather leave that upto someone who knows what they are doing! Ultimately, from a time point of view, I am planning on getting a new game out every 3-6 months. I am purely aiming at the growing iPad/Android tablet market. I would love to have a small team of 3 doing this fulltime, but it's difficult to find a way to do this and keep paying the bills. I have studied the market intensively, and most games never make it big, that is why I want to get more out quickly. It's all about marketing, online, reviews etc! And keeping at it! I have recently finished a 2d side-scroller game for pc using XNA. 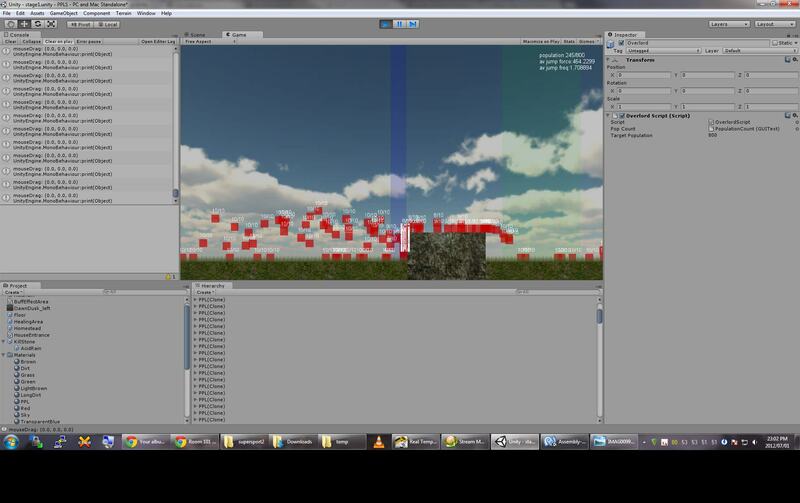 I am currently busy making a 3D game using Unity. I will be creating the same game twice, one will be a full 3d space game, and the other game will be the same but from a top-down view. These are two videos so far, and I will keep them updated. Just a quick update on my game.